I believe the iMac gave up the ghost yesterday. I came home yesterday and found it frozen with its fan racing at maximum speed. I’ve owned many Macs, but this one probably ranks among the worst of Apple’s lineup. This model suffered from a history of using sub-standard capacitors that blew up like little balloons after extended use and exposure to heat. Nevertheless, I managed to find a wonderful place to have those replaced for only $85 plus the cost of shipping out. It looks, however, like a major motherboard failure, so we’ll soon find ourselves back in the market for some kind of replacement. Maybe good fortune will shine upon us and bring us someone’s unneeded unit for little or no cost. I came into possession of this machine as part of my separation agreement with my former partner. 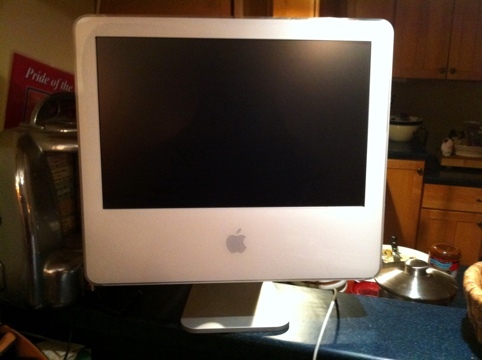 He had no use for Mac’s (or devoted friends) anyway, and while I initially marveled at the design quality of this unit, it obviously had some serious design flaws. I shared my problem with just about everyone who bought one of these things. I had a similar issue with my first Mac, a Mac Plus, which also had little tolerance for its own heat. Have an Intel based iMac or maybe a Mac Mini you’d like to unload cheap (or contribute to help a young girl’s education 😉 ), let me know, would you?